While supporting supporting FIM customers to assess their FIM environment and helping them to maintain their FIM configuration, 2 discussion topics are alltime favorites: FIM Security and FIM best practices. For ease of use I’ve been collecting this information in some articles. As you might see, there is still a lot of room for improvement, so I invite you to update the article where you think information is missing. 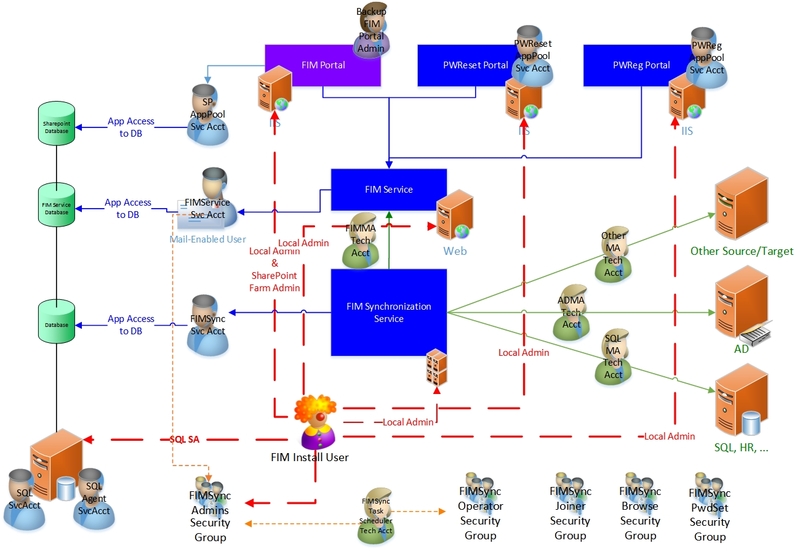 When discussing a basic FIM setup (using FIM Sync and FIM Service + Portal) a common diagram being drawn is the one below. It does not discuss the other FIM add-ons (like FIMCM, BHOLD or reporting) but still it’s a useful and very visual guidance for planning you security.